, an eminent philosopher, chemist, and antiquary, of the seventeenth century, and founder of the noble museum at Oxford, which still bears his name, was the only son of Mr. Simon Ashmole, of the city of Litchfield, in Staffordshire, sadler, by Anne, the daughter of Mr. Anthony Boyer, of Coventry, in Warwickshire, woollen-draper. He was born May 23, 1617, and during his early r education in grammar, was taught music, in which he made such proficiency as to become a chorister in the cathedral at Litchfield. When he had attained the age of sixteen he was taken into the family of James Paget, esq. a baron of the exchequer, who had married his mother’s sister, and as his father died in 1634, leaving little provision for him, he continued for some years in the Paget family, during which time he made considerable progress in the law, and spent his leisure hours in perfecting himself in music and other polite accomplishments. In March 1638, he married Eleanor, daughter of Mr. Peter Manwaring, of Smallwood, in the county Palatine of Chester, and in Michaelmas term the same year, became a solicitor in Chancery. On February 11, 1641, he was sworn an attorney of the court of common pleas, and on December 5th, in the same year, his wife died suddenly, of whom he has left us a very natural and affectionate memorial. The rebellion coming on, he retired from London, being always a zealous and steady loyalist, and on May 9, 1645, became one of the gentlemen of the ordnance in the garrison at Oxford, whence he removed to Worcester, where he was commissioner, receiver, and register of the excise, and soon after captain in the lord Ashley’s regiment, and comptroller of the ordnance. In the midst of all this business he entered himself of Brazen-Nose college, in Oxford, and applied himself vigorously to the sciences, but especially natural philosophy, mathematics, and astronomy; and his intimate acquaintance with Mr. (afterwards sir George) Wharton, seduced him into the absurd mysteries of astrology, which was in those days in great credit. In the month of July, 1646, he lost his mother, who had always been a kind parent to him, and for whom he had a | very pious regard. On October 16th, the same year, be was elected a brother of the ancient and honourable society of Free and Accepted Masons, which he looked upon as a high honour, and has therefore given us a particular account of the lodge established at Warrington in Lancashire and in some of his manuscripts, there are very valuable collections relating to the history of the free masons. 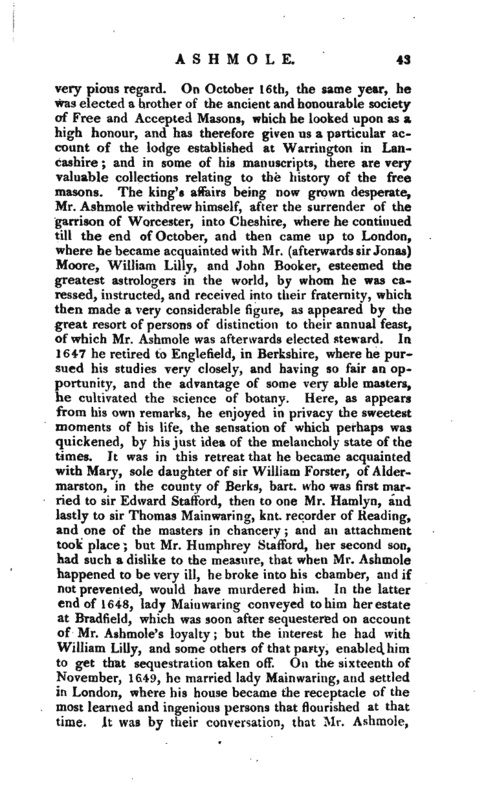 The king’s affairs being now grown desperate, Mr. Ashmole withdrew himself, after the surrender of the garrison of Worcester, into Cheshire, where he continued till the end of October, and then came up to London, where he became acquainted with Mr. (afterwards sir Jonas) Moore, William Lilly, and John Booker, esteemed the greatest astrologers in ‘the world, by whom he was caressed, instructed, and received into their fraternity, which then made a very considerable figure, as appeared by the great resort of persons of distinction to their annual feast, of which Mr. Ashmole was afterwards elected steward. Jn 1647 he retired to Englefield, in Berkshire, where he pursued his studies very closely, and having so fair an opportunity, and the advantage of some very able masters, he cultivated the science of botany. Here, as appears from his own remarks, he enjoyed in privacy the sweetest moments of his life, the sensation of which perhaps was quickened, by his just idea of the melancholy state of the times. It was in this retreat that he became acquainted with Mary, sole daughter of sir William Forster, of Aldermarston, in the county of Berks, bart. 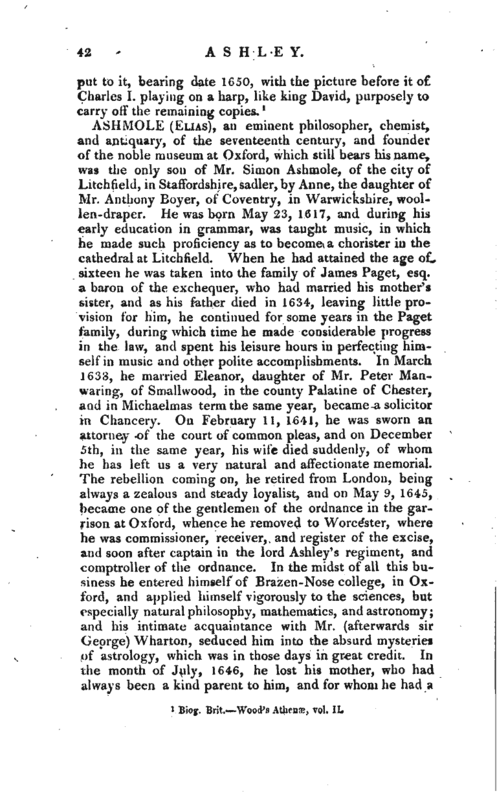 who was first married to sir Edward Stafford, then to one Mr. Hamlyn, and lastly to sir Thomas Mainwaring, knt recorder of Reading, and one of the masters in chancery and an attachment took place but Mr. Humphrey Stafford, her second son, had such a dislike to the measure, that when Mr. Ashmole happened to be very ill, he broke into his chamber, and if not prevented, would have murdered him. In the latter end of 1648, lady Mainwaring conveyed to him her estate at Bradfield, which was soon after sequestered on account of Mr. Ashmole’s loyalty but the interest he had with William Lilly, and some others of that party, enabled him to get that sequestration taken off. On the sixteenth of November, 1649, he married lady Mainwaring, and settled in London, where his house became the receptacle of the most learned and ingenious persons that flourished at that time. 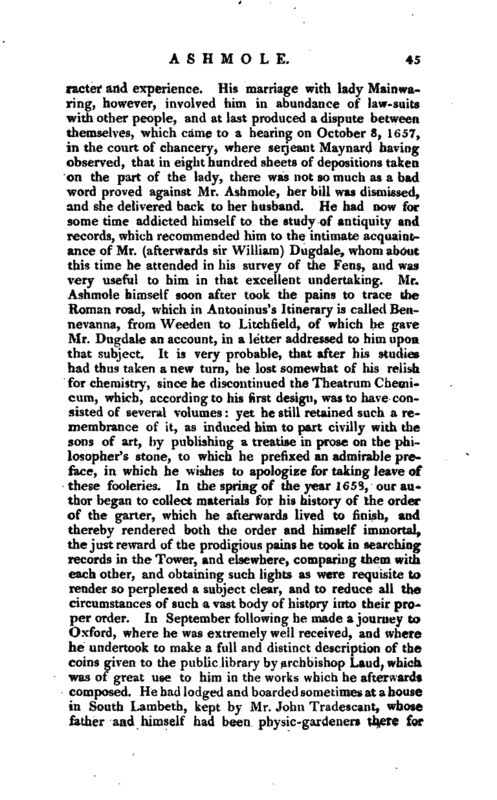 It was by their conversation, that Mr. Ashmole, | who hud been more fortunate in worldly affairs than most scholars are, and who had been always a curious collector of manuscripts, was induced to publish a treatise written by Dr. Arthur Dee, relating to the Philosopher’s stone, together with another tract on the same subject, by an unknown author. These accordingly appeared in the year following but Mr. Ashmole was so cautious, or rather modest, as to publish them by a fictitious name. 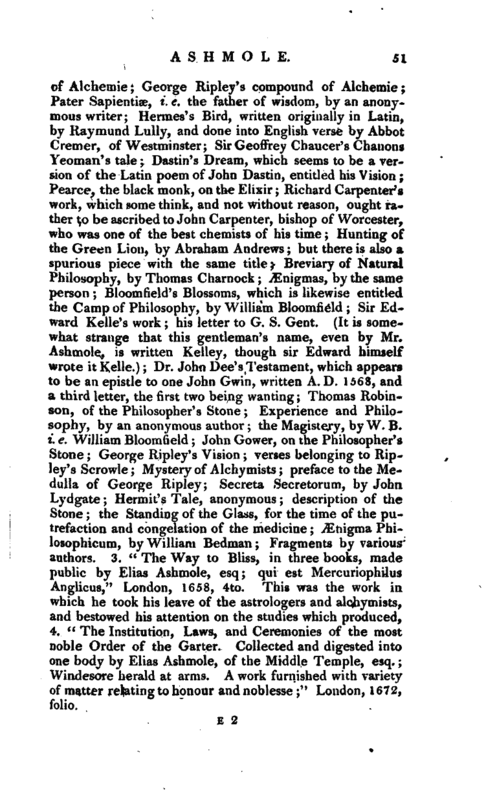 He at the same time addressed himself to a work of greater consequence, a complete collection of the works of such English chemists, as had till then remained in ms. which cost him a great deal of labour, and for the embellishment of which he spared no expence, causing the cuts that were necessary, to be engraved at his own house in Black-Friars, by Mr. Vaughan, who was then the most eminent artist in that department in England. 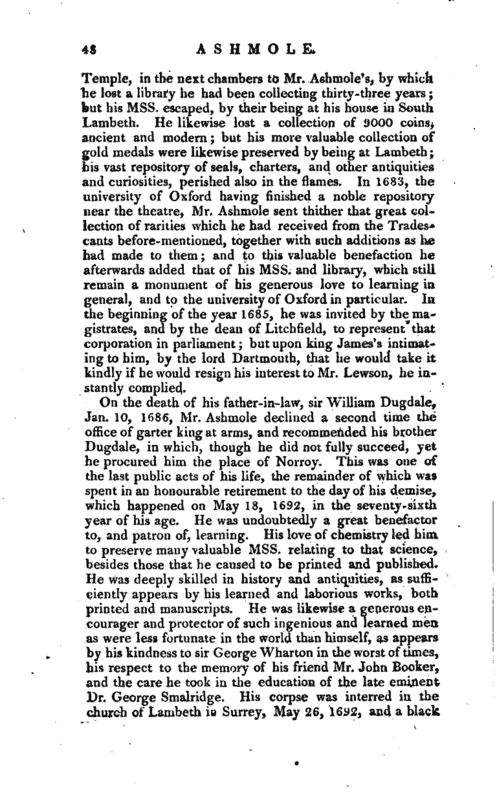 He imbibed this affection for chemistry from his intimate acquaintance with Mr. William Backhouse, of Swallowfield in the county of Berks, who was reputed an adept, and whom, from his free communication of chemical secrets, Mr. Ashmole was wont to call father, agreeably to the custom which had long prevailed among the lovers of that art, improperly, however, called chemistry for it really was the old superstition of alchemy. He likewise employed a part of his time in acquiring the art of engraving seuls, casting in sand, and the mystery of a working goldsmith. 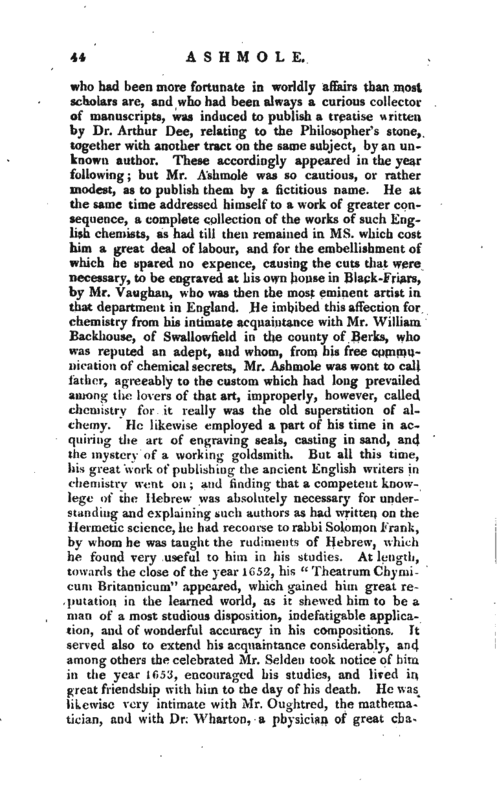 But all this time, his great work of publishing the ancient English writers in chemistry went on and finding that a competent knowlege of the Hebrew was absolutely necessary for understanding and explaining such authors as had written on the Hermetic science, he had recourse to rabbi Solomon Frank, by whom he was taught the rudiments of Hebrew, which he found very useful to him in his studies. At length, towards the close of the year 1652, his “Theatrum Chymicum Britannicum” appeared, which gained him great reputation in the learned world, as it shewed him to be a man of a most studious disposition, indefatigable application, and of wonderful accuracy in his compositions. It served also to extend his acquaintance considerably, and among others the celebrated Mr. Seiden took notice of him in the year 1653, encouraged his studies, and lived in great friendship with him to the day of his death. He was likewise very intimate with Mr. Oughtred, the mathematician, and with Dr. Wharton, a physician of great | racter and experience. His marriage with lady -Main-waring, however, involved him in abundance of law-suits with other people, and at last produced a dispute between themselves, which came to a hearing on October 8, 1657, in the court of chancery, where serjeant Maynard having observed, that in eight hundred sheets of depositions taken on the part of the lady, there was not so much as a bad word proved against Mr. Ashrnole, her bill was dismissed, and she delivered back to her husband. He had now for some time addicted himself to the study of antiquity and records, which recommended him to the intimate acquaintance of Mr. (afterwards sir William) Dugdale, whom about this time he attended in his survey of the Fens, and was very useful to him in ’that excellent undertaking. Mr. Ashmole himself soon after took the pains to trace the Roman road, which in Antoninus’s Itinerary is called Bennevanna, from Weeden to Litchfield, of which he gave Mr. Dugdale an account, in a letter addressed to him upon that subject. 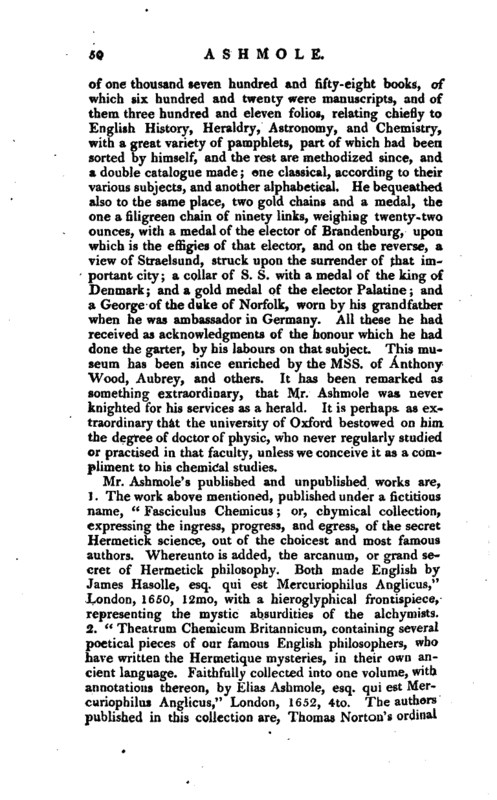 It is very probable, that after his studies had thus taken a new turn, he lost somewhat of his relish for chemistry, since he discontinued the Theatrum Chemicum, which, according to his first design, was to have consisted of several volumes yet he still retained such a remembrance of it, as induced him to part civilly with the sons of art, by publishing a treatise in prose on the philosopher’s stone, to which he prefixed an admirable preface, in which he wishes to apologize for taking leave of these fooleries. In the spring of the year 1658, our author began to collect materials for his history of the order of the garter, which he afterwards lived to finish, and thereby rendered both the order and himself immortal, the just reward of the prodigious pains he took in searching records in the Tower, and elsewhere, comparing them witU each other, and obtaining such lights as were requisite to render so perplexed a subject clear, and to reduce all the circumstances of such a vast body of history into their proper order. In September following he made a journey to Oxford, where he was extremely well received, and where he undertook to make a full and distinct description of the coins given to the public library by archbishop Laud, which was of great use to him in the works which he afterwards composed. He had lodged and boarded sometimes at a house in South Lambeth, kept by Mr. John Tradescant, whose father and himself hud been physic-gardeners there for | many years, and had collected avast number of curiosities, which, after mature deliberation, Mr. Tradescant and his wife determined to bestow on Mr. Ashmole, and accordingly sealed and delivered a deed of gift for that purpose, on December 16, 1659. On the restoration of king Charles II. Mr. Ashmole was Dearly introduced into the presence and favour of his majesty, and on June 18, 1660, which was the second time he had the honour of discoursing with the king, he graciously bestowed upon him the place of Windsor herald. A few days after, he was appointed by the king to make a description of his medals, and had them delivered into his hands, and king Henry VHIth’s closet assigned for his use, being also allowed his diet at court. On August 21st, in the same year, he presented the three books which he had published, to his majesty, who, as he both loved and understood chemistry, received them very graciously. On September 3, he had a warrant signed for the office of commissioner of the excise, in consequence of a letter written by his majesty’s express command, to the earl of Southampton, then lord high-treasurer, by Mr. Se^ cretary Morris. 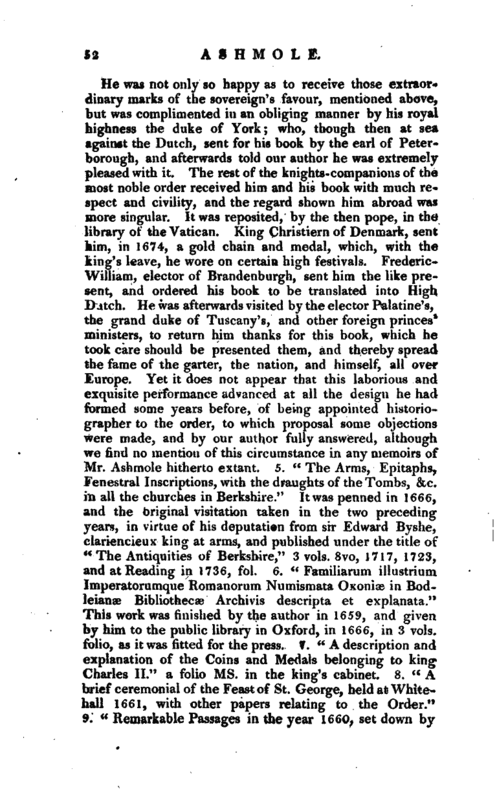 About this time, a commission was granted to him as incidental to the care of the king’s medals, to examine the famous, or rather infamous, Hugh Peters, about the contents of the royal library which had fallen into his hands, and which was very carefully and punctually executed, but to very little purpose. On November 2d, he was called to the bar in Middle-Temple hall, and January 15, 1661, he was admitted a fellow of the Royal Society. On February 9th following, the king signed a warrant for constituting him secretary of Surinam in the West Indies. In the beginning of the year 1662, he was appointed one of the commissioners for recovering the king’s goods, and about the same time he sent a set of services and anthems to the cathedral church of Litchfield, in memory of his having been once a chorister there, and he gave afterwards twenty pounds towards repairing the cathedral. On June 27, 1664, the White Office was opened, of which he was appointed a commissioner. On Feb. 17, 1665, sir Edward By she sealed his deputation for visiting Berkshire, which visitation he began on the llth of March following, and on June 9, 1668, he was appointed by the lords commissioners of the treasury, accomptant-general, and country accomptant in the excise. His second wife, lady Main waring, dying, April 1, in the | same year, he soon after married Mrs. Elizabeth Dugdale, daughter to his good friend sir William Dugdale, kht. garter king at arms, in Lincoln’s-inn chapel, on Novembers. The university of Oxford, in consideration of the many favours they had received from Mr. Ashmole, created him doctor of physic by diploma, July 19, 1669, which was presented to him on the 3d of November following, by Dr. Yates, principal of Brazen-Nose college, in the name of the university. He was now courted and esteemed by the greatest people in the kingdom, both in point of title and merit, who frequently did him the honour to visit him at his chambers in the Temple, and whenever he went his summer progress, he had the same respect paid him in the country, especially at his ‘native town of Litchfield, to which when he came, he was splendidly entertained by the corporation. On May 8, 1672, he presented his laborious work on the most noble order of the garter, to his most gracious master king Charles II. who not only received it with great civility and kindness, but soon after granted to our author, as a mark of his approbation of the work, and of his personal esteem for him, a privy seal for 400 pounds out of the custom of paper. This was his greatest undertaking, and had he published nothing else, would have preserved his memory, as it certainly is in its kind one of the most valuable books in our language. On January 29, 1675, he resigned his office of Windsor herald, which by his procurement, was bestowed on his brother Dugdale, It was with great reluctancy that the earl marshal parted with him, and it was not long after, that he bestowed on him the character of being the best officer in his office. On the death of sir Edward Walker, garter king at arms, Feb_ 20, 1677, the king and the duke of Norfolk, as earl marshal, contested the right of disposing of his place, on which Mr. Ashmole was consulted, who declared in favour of the king, but with so much prudence and discretion as not to give any umbrage to the earl marshal. He afterwards himself refused this high office, which was conferred on his father-in-law sir -William Dugdale, for whom he employed his utmost interest. About the close of 1677, a proposal was made to Mr. Ashmole to become a candidate for the city of Litchfield, but finding himself poorly supported by the very persons who would have encouraged him to stand, he withdrew his pretensions. On the 26th of January, 1679, about ten in the morning, a fire began in the Middle | Temple, in the next chambers to Mr. Aslimole’s,- by which he lost a library he had been collecting thirty-three years; but his Mss. escaped, by their being at his house in South Lambeth. He likewise lost a collection of 9000 coins, ancient and modern but his more valuable collection of gold medals were likewise preserved by being at Lambeth his vast repository of seals, charters, and other antiquities and curiosities, perished also in the flames. In 1683, the university of Oxford having finished a noble repository near the theatre, Mr. Ashmole sent thither that great collection of rarities which he had received from the Tradescants before-mentioned, together with such additions as he had made to them; and to this valuable benefaction he afterwards added that of his Mss. and library, which still remain a monument of his generous love to learning in general, and to the university of Oxford in particular. In the beginning of the year 1685, he was invited by the magistrates, and by the dean of Litchfield, to represent that corporation in parliament but upon king James’s intimating to him, by the lord Dartmouth, that he would take it kindly if he would resign his interest to Mr. Levvson, he instantly complied. On the death of his father-in-law, sir William Dugdale, Jan. 10, 1686, Mr. Ashmole declined a second time the office of garter king at arms, and recommended his brother Dugdale, in which, though he did not fully succeed, yet he procured him the place of Norroy. This was one of the last public acts of his life, the remainder of which was spent in an honourable retirement to the day of his demise, which happened on May 18, 1692, in the seventy-sixth year of his age. He was undoubtedly a great benefactor to, and patron of, learning. His love of chemistry led him to preserve many valuable Mss. relating to that science, besides those that he caused to be printed and published. He was deeply skilled in history and antiquities, as sufficiently appears by his learned and laborious works, both printed and manuscripts. He was likewise a generous encourager and protector of such ingenious and learned men as were less fortunate in the world than himself, as appears by his kindness to sir’George Wharton in the worst of times, his respect to the memory of his friend Mr. John Booker, and the care he took in the education of the late eminent Dr. George Smalridge. His corpse was interred in the church of Lambeth in Surrey, May 26 1692, and a black | marble stone laid over his grave, with a Latin inscription, in which, though there is much to his honour, there is nothing which exceeds the truth. He may be considered as one of the first and most useful collectors of documents respecting English antiquities, but the frequent application of the epithet genius to him, in the Biographia Britannica, is surely gratuitous. His attachment to- the absurdities of astrology and alchemy, and his association with Lilly, Booker, and other quacks and impostors of his age, must ever prevent his being ranked among the learned wise, although he never appears to have been a confederate in the tricks of Lilly and his friends, and certainly accumulated a considerable portion of learning and information on various useful topics. His benefaction to the university of Oxford will ever secure respect for his memory. It was towards the latter end of October 1677, that he made an offer to that university, of bestowing on it all that valuable collection of the Tradescants, which was so well known to the learned world, and which had been exceedingly improved since it came into his possession, together with all the coins, medals, and manuscripts of his own collecting, provided they would erect a building fit to receive them to which proposition the university willingly assented. Accordingly, on Thursday the 15th of May 1679, the first stone of that stately fabric, afterwards called Ashmole’s Museum, was laid on the west side of the theatre, and being finished by the beginning of March 1682, the collection was deposited and the articles arranged by Robert Plott, LL.D. who before had been intrusted with their custody. This museum was first publicly viewed, on the 2 1st of May following, by his royal highness James duke of York, his royal consort Josepha Maria, princess Anne, and their attendants, and on the 24th of the same month, by the doctors and masters of the university. In a convocation held on the 4th of June following (1683) a Latin letter of thanks, penned by him who was then deputy orator, being publicly read, was sent to Mr. Ashmole at South Lambeth, In July 1690, he visited the university with his wife, and was received with all imaginable honour, and entertained at a noble dinner in his museum; on which occasion Mr. Edward Hannes, A. M. the chemical professor, afterwards an eminent physician, made an elegant oration to him. His benefaction to the university was very considerably enlarged at his death, by the addition of his library, which consisted | of one thousand seven hundred and fifty-eight books, of which six hundred and twenty were manuscripts, and of them three hundred and eleven folios, relating chiefly to English History, Heraldry, Astronomy, and Chemiftry, with a great variety of pamphlets, part of which had been sorted by himself, and the rest are methodized since, and a double catalogue made one classical, according to their various subjects, and another alphabetical. He bequeathed also to the same place, two gold chains and a medal, the one a filigreen chain of ninety links, weighing twenty-two ounces, with a medal of the elector of Brandenburg, upon which is the effigies of that elector, and on the reverse, a iHew of Straelsund, struck upon the surrender of that important city; a collar of S. S. with a medal of the king of Denmark; and a gold medal of the elector Palatine; and a George of the duke of Norfolk, worn by his grandfather when he was ambassador in Germany. All these he had received as acknowledgments of the honour which he had done the garter, by his labours on that subject. This museum has been since enriched by the Mss. of Anthony Wood, Aubrey, and others. It has been remarked as something extraordinary, that Mr. Ashmole was never knighted for his services as a herald. 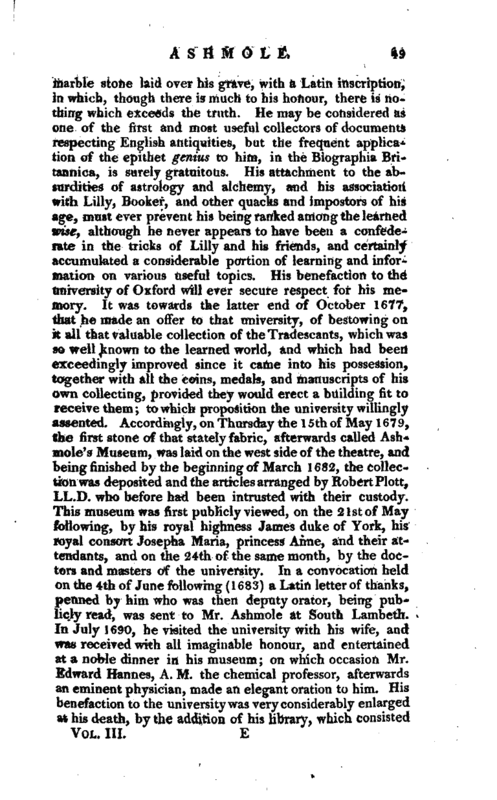 It is perhaps as extraordinary that the university of Oxford bestowed on him the degree of doctor of physic, who never regularly studied or practised in that faculty, unless we conceive it as a compliment to his chemical studies. 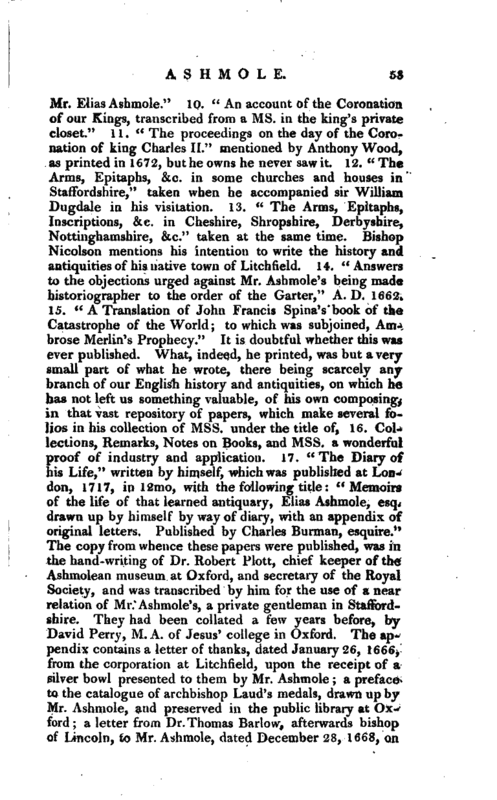 Mr. Ashmole‘ s published and unpublished works are, 1. The work above mentioned, published under a fictitious name, “Fasciculus Chemicus or, chymical collection, expressing the ingress, progress, and egress, of the secret Hermetick science, out of the choicest and most famous authors. Whereunto is added, the arcanum, or grand secret of Hermetick philosophy. Both made English by James Hasolle, esq. qui est Mercuriophilus Anglicus,” London, 1650, 12mo, with a hieroglyphical frontispiece, representing the mystic absurdities of the alchy mists. 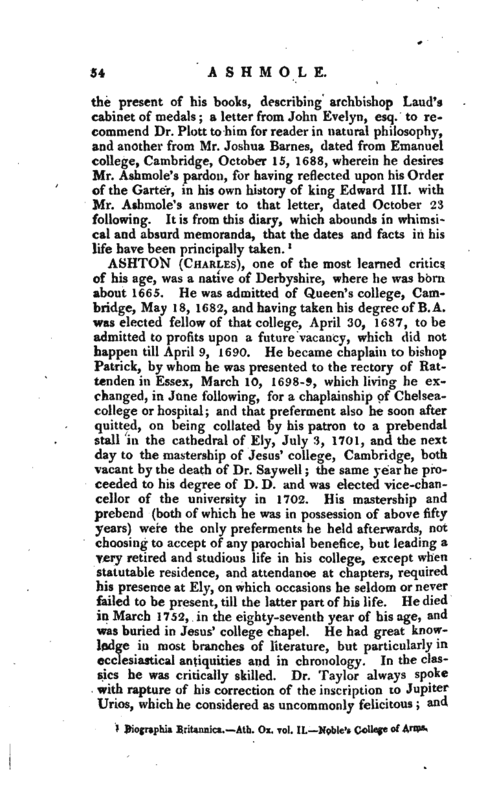 Biographia Britannica. —Ath. Ox. vol. II. Noble’s College of Arms.